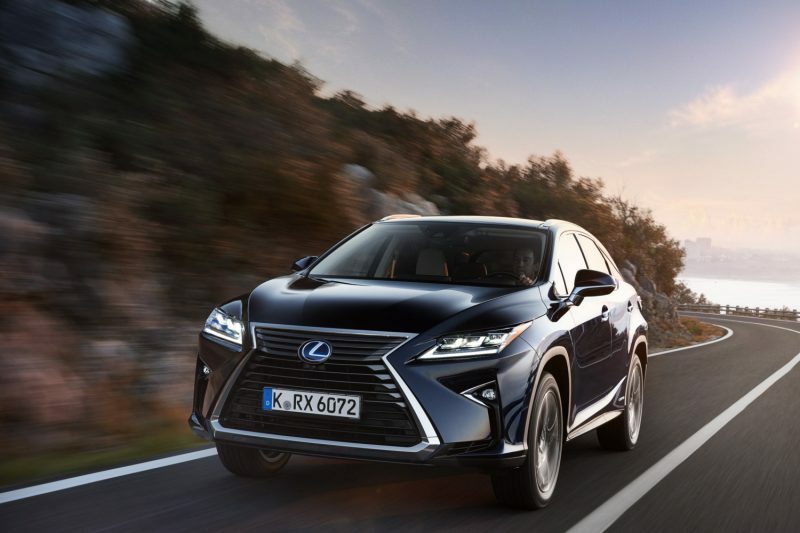 The new Lexus RX450h hybrid goes on sale in Ireland in the next week. The large luxury SUV/crossover will cost from €69,650, while road tax comes to €270. This new, fourth generation RX, has undergone major changes; it’s much, much sharper looking but sticks with the 5-seat formula even though most rivals have seven-seat options. Lexus says there is a real demand for 5-seaters at this level. It also sticks with the nickel metal hydride battery technology while other have adapted lithium ion. The new car is longer and wider, so it’s no surprise there is more room, especially at the rear of a smartly designed, comfortable cabin. Lexus has created space by, for example, lowering the seats (19mm), dash and rear floor. But even with just two rows of seats, there isn’t copious boot space. I’m a big fan of the driving position and there was much better all-round visibility – thinner front and rear pillars help with that. The seats were excellent. And it was so quiet on the road – thanks to a lot of work in the bulkhead, wheel arches, bonnet, etc. I kid you not, but Lexus claims a ‘world first’ in, of all things, a cupholder. With it you can adjust to accommodate all sorts of shape and sizes of bottles and cans. The 3.5-litre V6 engine has been heavily overhauled. On its own it produces 262bhp; with the electric motor you get 313bhp from the combined hybrid system. That’s impressive power from a combo that manages a claimed fuel consumption of 5.2litres/100km. The power is reflected in an 0-100kmh time of 7.7secs, excellent torque (80kmh to 100kmh in 5.8 secs) while emissions of 122g/km peg road tax at €270. They have tweaked the electric power steering but it was still too soft and woolly for me, even in Sport+ mode. And despite a revised suspension I think it still leans towards comfortable rather than dynamic – the BMW X5, Audi Q7 and Range Rover Sport are well ahead. However, the Adaptive Variable Suspension (AVS) on F SPORT and Premium is designed for sportier handling. The AWD system kicks in when needed for extra traction and grip but can allow the rear motor to act like a generator to charge the battery when the car is in regenerative braking mode. As usual there is a variety of driving modes and drives: ECO, NORMAL, SPORT, SPORT S and SPORT S+. And then there is, for the first time, a CUSTOMIZE mode which lets you choose what mix of engine, hybrid system, chassis, and air con you want. You can completely shut down the engine and choose EV DRIVE too – but it doesn’t last too long on electric-only. There’s a big choice of spec levels but their SAFETY SYSTEM + is on all and the company claims it’s the most advanced of its kind in the segment. Some of the audio systems are more than interesting. The standard includes HD radio, Bluetooth and nine speakers. Then there is a 12-speaker Pioneer system which uses 20-cm subwoofers and newly-developed 18-cm woofers in the front doors. And top of the tree is a 15-speaker Mark Levinson premium surround system. Standard (Executive) spec includes the likes of adaptive cruise control, 2-zone climate control, 18ins alloys, leather, rain sensing wipers, lane assist, Pre-Crash Safety, 10 airbags, ISOFIX on outer rear seats, 8ins screen, fog lights, 4.2ins colour multi-information display and temporary spare tyre. Luxury, which is what I drove first and will be the big seller, adds 20ins alloys, premium sat nav, 12-speaker audio, 12.3ins multi-information display, climate control with auto recirculation, ‘smart’ tailgate . F SPORT adds Adaptive Variable Suspension, cornering lights, paddle shifts, 10ins heads-up display, 4-mode Sport driving, special design (inside and out) and that 15-speaker Mark Levinson system. Finally Premium also has semi-aniline leather seats and heated rear seats. Prices start at €69,650 with Luxury costing €76,450, F SPORT at €83,950; and Premium €86,250. The new RX 450h is arriving at a time when there’s an upsweep in demand for such luxury SUVs. It is, as ever from Lexus, exemplary in its attention to detail without heralding a revolutionary breakthrough as such. As of now there are no plans for a plug-in version.